We appreciate your emails with prayer and thoughtfulness. They were translated and uploaded to Japanese page to encourage brothers and sistersstruggling in Tohoku. And we were much grateful to know donation for this disaster had started in many places. 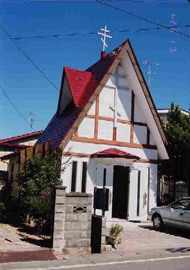 Yesterday, we received photos of two church located in the Sanriku Coast, uploaded to the website. 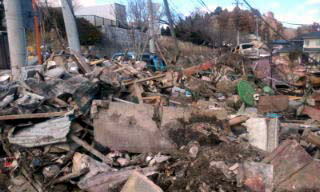 There were five churches along Sanriku Coast, with deeply indented coastline, suffered by tsunami. We found out that one is destroyed, one is still unknown, but the other three were safe, even though minor repairs seemed necessary. 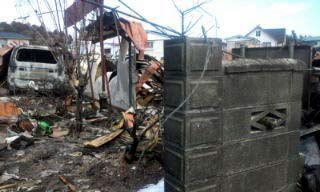 Especially, Holy Ascension Church in Sakari(Ofunato) is quite safe, even though City of Ofunato is one of the worst destructed places. Bishop Seraphim said the Diocese made contact with 80% of parishioners living in the coastal area and continue investigation on damage of parishioners, too. Please continue keeping us in your prayer. Fr. George and Maria Matshushima"
Fr. George Matshushima serves at the Holy Theophany church in Nagoya, Japan. To donate to the Orthodox in Japan, please click here. Ruins of the Annunciation church.